could the comers there unto be perfected. . . .
Adam did not suffer one death penalty, but two. It is important to emphasize the word penalty. Adam received a double death sentence, and died twice. sentence. It would never have been imposed had he not brought it upon himself as a consequence of disobedience. Had physical death been inevitable for Adam, it could not have been presented as a threat, as a penalty, against disobedience. (236) The result of his disobedience was not merely that he shortened his life so that he died sooner than he would have done otherwise. What Adam actually did was to introduce an entirely new and foreign factor into human experience, the tragedy of physical death. For man, it is indeed a tragedy, the rending asunder of spirit and body and the dissolution of human relationships. It is the "last enemy" that is to be dealt with in the Plan of Redemption (1 Corinthians 15:26). Because Adam, like all other men, was a body/spirit entity, he was capable of experiencing both physical and spiritual death. Although he need never have experienced either kind of death if he had remained obedient, he failed the test and by a single act of disobedience suffered two deaths. His spirit died that very day, and his body died centuries later. Disobedience was not forced upon him. He was, as God first made him, free to choose, to sin or not to sin and therefore to die twice or never to die at all. We know this to be the case because precisely the same thing was true of the Lord Jesus who stood where Adam had originally stood, as Federal Head of a race of truly human beings. He, too, experienced two deaths � neither of which was inevitable. The new human race which He is bringing into being as a result of his own two deaths, will never again die spiritually and will one day be placed beyond the power of physical death as well. When that comes to pass, the redeemed of the Lord will not merely be able not to die and not to sin (as Adam had once been) but not able to die and not able to sin � which is a far more wonderful thing. It will be constitutionally impossible for them to do either. The very possibility of sinning and the very possibility of dying will be gone for ever. The Lord as our substitute therefore had to suffer two deaths, the one spiritual and the other physical. The spiritual death normally precedes the physical. Death, in the most comprehensive sense, may be defined as "being cut off from the source of all life." To be cut off from the source of spiritual life is spiritual death: to be cut off from the source of physical life is physical death. With respect to the former, Ezekiel 18:4 tells us simply, "The soul that sinneth, it shall die"; meaning that the individual who commits actual SINS will be cut off from the source of all spiritual life which is in God. This spiritual law is as much a part of the spiritual constitution of the Universe as the law of gravity is of the physical constitution of the Universe. There are no exceptions. If exceptions could be made in either case, the Universe would not be a Cosmos but a Chaos. 236. See Notes at the end of this chapter (page 16). By contrast with spiritual death, physical death is not the result of actual SINS committed by the individual; since innocent babies die. Physical death entered into human experience as a defect in the organism. It is inherited by natural generation which, in Romans 5:12, is spoken of as SIN (in the singular). * This process begins with birth (if not sooner), and progressively ruptures the essential connection with the stream of physical life, which also resides in God. The Bible everywhere bears witness to the fact that both kinds of death are real and that the only corrective for either is resurrection. The redeemed are resurrected with Christ as to their spirits when they are born again. Ephesians 2:5 and 6 reads: "When we were dead in SINS [God] quickened us together with Christ . . . and hath raised us up together [with Him]." And the spiritually resurrected will never die again: "Whosoever liveth and believeth in Me shall never die" (John 11:26). And in Christ we are yet to be made alive as to our bodies which will also be placed for ever beyond the power of death. Thus 2 Corinthians 5:1 reads: "For we know that if our earthly house of this tabernacle be dissolved, we have a building of God, an house not made with hands, eternal in the heavens. . ." [my emphasis]. As is the order of the two deaths, so is the order of the two resurrections for the redeemed: first the spiritual and after that the physical. * On the distinction between SIN and SINS, Calvin wrote: "Original sin, then, may be defined as a hereditary corruption . . . which makes us obnoxious in the sight of God, and then produces in us works which in Scripture are termed 'the works of the flesh.' This corruption is repeatedly designated by Paul by the term SIN (Galatians 5:19), while the works which proceed from it . . . he terms the fruits of SIN . . . also termed SINS." (Institutes, Bk. 2, chap.1, § 5]. Similarly, Griffith Thomas wrote: "The Bible clearly distinguishes 'sin' and 'sins,' the root and the fruit, the principle and the practice; and Article II (of the Thirty-Nine Articles of the church of England) teaches that our Lord's Atonement covers both of these." [The Principles of Theology, Grand Rapids, Baker, reprint, 1979, p. 50]. See also Arthur Custance, "The Compelling Logic of Salvation: A Study of the Difference Between SIN and SINS", Part VII in Man in Adam and in Christ, vol.3 of The Doorway Papers Series. † The case of death in childhood while in a state of innocence is of course an exception, since spiritual death does not precede physical death. But this is not the expected order of events. order. This is of crucial importance to an understanding of the circumstances surrounding the crucifixion: it has a direct bearing upon the fact that crucifixion was part of God's intention as Acts 2:23 clearly implies. Most systemic theologies recognize the fact implicitly but do not spell it out explicitly. The circumstances of the crucifixion are therefore not explored as they deserve to be and crucifixion per se tends to be assumed as the death of God's appointment chiefly because of the curse associated with it according to Deuteronomy 21:22 and 23. This is a proper reason to emphasize, but I do not believe it is the most important one. After all, only the Jewish people saw crucifixion as a mark of God's cursing. The nations around do not seem to have regarded it in this way, but only as a mark of society's cursing. I believe the cross was primarily appointed because it was required as a Stage upon which the Lord's spiritual death could be demonstrated during the hours of darkness. Only when this death had been accomplished, could He then accomplish the second death, physical death by an act of will. It was the long interval between the beginning of execution and the end of execution which made crucifixion unique. It was for this reason that we have the anomaly of a non-Jewish mode of execution appointed for their Messiah. Now Peter is very explicit in his statement that the Lord Jesus "in his own self bare our sins in his own body on the tree" (1 Peter 2:24). "In his own self," i.e., He truly did Himself take the responsibility for our personal SINS. He did this "in his body on the tree," that is to say, while still alive on the cross. The circumstances of the Lord's execution were such that opportunity was provided for an event which any other kind of execution traditionally adopted by the Jewish people would not have permitted. The factor in question was one of time, of delay in dying. Crucifixion was a terribly slow form of execution. We have already observed that the Jews employed several modes of capital punishment: beheading, stoning, and strangling. Burning is also mentioned in Jewish law, but it seems rather to have been a way of desecrating the corpse than actually carrying out the death penalty. It was like crucifixion in this respect, and yet unlike crucifixion in that it was still comparatively swift. In none of the three normal Jewish forms of execution was physical suffering unnecessarily drawn out. They were shocking � violent enough � but swift. Protracting the actual dying of the condemned man was not part of Jewish legal practice or philosophy. the accused down from a promontory of some kind. In either case stoning to death followed immediately and was done under controlled conditions. It was thus a reasonably swift death. Upon occasion the victim, by being pushed over a cliff, was killed in the process, and if death was believed to have already occurred, no further stoning was considered necessary. Paul escaped stoning on one occasion for this reason (Acts 14:19). But such a swift death could not have been God's intention for the Lord Jesus, since part of the sacrifice He was to make on our behalf required a time interval that would not have been allowed for in beheading, stoning, or strangling. Several times the Jews had sought to stone Him, but He had protected Himself in each instance against their designs (John 8:59; 10:31; 11:8). To set the stage for a better understanding of the part which this time interval played in the Plan of Redemption, we must examine briefly what happened to the two sacrificial goats on the Great Day of Atonement. And to do this meaningfully, it is necessary to review in a general way the arrangement of the Temple and especially the Holy of Holies, of which we must speak further later on in connection with the Lord's actions after his bodily resurrection. Having done this, we shall then be in a better position in the next two chapters, first to understand something of the meaning of the Lord's suffering during the hours of darkness, and secondly to understand the circumstances of his actual dying at the very end. The Great Day of Atonement, sometimes referred to simply as The Day, was indeed the high point of the year in Israel's religious life. It marked the occasion for the re-establishment of a full covenant relationship between God and his people and guaranteed the continuance of sacrificial communion. It was the one day of the year in which the High Priest as a representative of his people, entered personally into the very presence of God within the Holy of Holies, the most sacred part of the temple complex, to make atonement. And atonement had to be made for both SINS and SIN, i.e., for spiritual as well as physical death. It covered all old debts and left the nation with a clean sheet for the coming year. It was a kind of "concealment" of guilt and corruption in the sight of God. It was therefore still only a temporary reprieve (Hebrews 10:1,2,11). compromise. It is probably essentially correct in its general arrangement and any errors will not seriously detract from an understanding of what took place on the Day of Atonement. 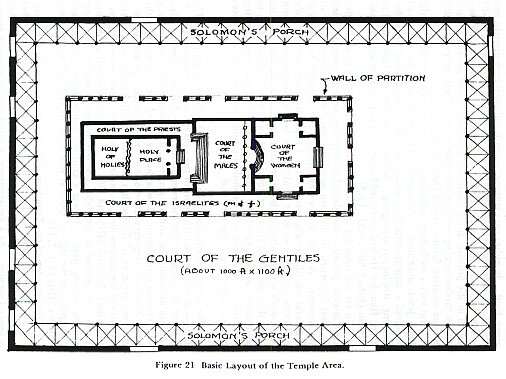 Basically the whole layout represents the Temple platform as finally constructed under Solomon. Around the perimeter was a colonnaded shelter from the sun which became, later, the habitual meeting place of the early Christians in Jerusalem. Gentiles were allowed in this peripheral area. Approximately in the centre of the platform and encompassing a much smaller area was a low wall about four feet high which was probably colonnaded along the top. This was the Middle Wall of Partition beyond which no Gentile was allowed to go, on pain of death. Within this Wall of Partition was the Court of the Israelites, male and female. Occupying somewhat less space within this wall were the structures of the Temple itself as shown in the diagram, comprising at the eastern end the Women's Court which then led up a number of steps into the Court of male Israelites. Moving towards the west and up another flight of steps one entered the Court of Priests. Within this area was the main structure, the Holy Place and the Holy of Holies. The Holy Place was entered via a kind of vestibule as indicated, and in it were housed a number of important sacred objects including the Table of Shewbread and an altar for the burning of incense. Apparently the width of this Holy Place was equal to that of the Holy of Holies, which was thirty feet by thirty feet by thirty feet high (1 Kings 6:20). The Holy of Holies was separated from the Holy Place by an enormous double* curtain or veil which must therefore have been thirty feet high and stretched from wall to wall. It was this double curtain which was rent from top to bottom at the time of the Lord's death. The Holy Place was a place of particular sanctity. It could be entered only by the priests, and only then upon appropriate occasions. By contrast, the Holy of Holies was still more sacrosanct and could be entered by the High Priest alone, and even then only once a year. This supremely holy place was constructed without windows and, assuming that the double curtain sealed it off completely, would accordingly be in total darkness and very probably absolute silence. It was an awe-ful cavernous place of mystery. * See Smith's Dictionary of the Bible, vol.IV, p.3156, column a: and for the possible reasons for this dual structure, see C. R. Conder, Handbook to the Bible, London, Longmans, Green, 1880, p.123. finger of God (Exodus 31:18 and 1 Kings 8:21). Later there was placed, either beside it or in it, the original text of Moses' Book of the Law (Deuteronomy 31:26). Subsequently some manna in a jar and Aaron's rod that had budded in vindication of Moses' authority (Numbers 17:1�13) were also placed in the Ark of the Covenant (Hebrews 9:4). However, when Solomon finally installed the Ark in its place in the Temple, only the two Tables of Stone were found within it (1 Kings 8:9). After the fall of Jerusalem in 586 B.C. and the destruction of Solomon's Temple, the Ark seems to have disappeared entirely, and we have no knowledge of what furnishings were put in their place in the Temple which was ultimately rebuilt by Zerubbabel and refurbished by Herod in our Lord's time. It is a strange circumstance that of this one day above all others in the Jewish calendar we really have so little detailed information. In Hebrew, the Day of Atonement was referred to simply as "The Day," Ha-Yom. When Hebrew had been replaced by Aramaic in the time of our Lord, it was referred to as Yoma which means the same thing. It was also referred to commonly as Yom Kippur, which means "the day of covering." Our word atonement is a translation of the original Hebrew word which meant covering; thus the Day of Atonement was strictly a Day of Covering. This reflects the truth, which must have been understood by those who were spiritually discerning in Israel, that animal sacrifices could never really take away human sin but served merely as a temporary 'covering' until God Himself should provide the eternal sacrifice once for all. It was the most solemn occasion of the year because if all went well during the ceremonies and no great judgment fell upon the officiating High Priest to signal God's displeasure, it was believed that their covenant was once more established with Jehovah for the coming year. Accordingly tremendous care was taken to ensure that everything required by law was precisely fulfilled. The events which occurred on the Day of Atonement are described for us only in one place in Scripture and we have virtually no other information. We therefore are primarily dependent upon the descriptive details of Leviticus 16. It seems appropriate to set forth the injunctions as we find them here in order that we may more meaningfully draw attention to certain details that symbolize in a wonderful way the Lord's work on the cross. But in the interests of simplicity certain sections of Leviticus 16 will be abbreviated. And the Lord spake unto Moses after the death of the two sons of Aaron, when they offered before the Lord and died. . . . Speak unto Aaron thy brother, that he come not at all times into the Holy of Holies within the veil before the mercy seat which is upon the ark; that he die not: for I will appear in the cloud upon the mercy seat. Then there followed instructions for the High Priest, who was the chief actor in this drama, that he himself might be forgiven and cleansed. Great care was taken in this matter, and preparation for this Day began some days before. Every precaution was taken to ensure that he would not be contaminated in any way by touching or being touched by anything that was dead or anyone who was unclean. In case such a thing should happen by accident during the preparatory period, provision was made for him to step down from the office and a substitute to take his place. Josephus tells us that only once in all the centuries did it happen that the High Priest had to be replaced for the ceremony. On the final day, the Great Day of the ceremony, the High Priest was bathed and clothed in several garments of linen, and offered a sacrifice on his own behalf. He then took up his position at the entrance to the Holy Place for the presentation of two goats which were to be sacrificed for the nation. These two goats were to be male, and as alike as they could possibly be, preferably of the same mother, and of the same age. They were to be without blemish of any kind and great care was to be exercised in their examination to ensure their physical perfection. They were to be kids of goats, symbolizing the innocence of childhood. the other for the scapegoat. And Aaron shall bring the goat upon which the Lord's lot fell and offer him for a sin-offering. But the goat on which the lot fell to be a scapegoat, shall be presented alive before the Lord, to make an atonement with him, and to let him go for a scapegoat into the wilderness. The meaning of the word rendered scapegoat (in Hebrew, Azazel) has been discussed for years and remains uncertain. Modern translations tend to transliterate the original into English as it stands. The simplest suggestion, and one of the oldest, is that it is a descriptive adjective meaning "utterly banished." The Semitic root behind the word, found in Arabic but not yet known in Hebrew, is Azal ( ) which according to Gesenius means to forsake or banish. The form Azazel ( ) may be a Pealpal form of the root verb Azal which in Hebrew would be termed the intensive form. Hebrew verbs are highly flexible. "To kill" could be changed to mean "to slaughter" by merely changing the vowels while retaining the root consonants. To convert the English verb "to break" into "to shatter," we employ a different root: but Hebrew need not. So here while Azal means to banish, Azazel means to banish utterly. The meaning of the words "for the scapegoat" might therefore be literally rendered "for the one utterly banished," or possibly in prospect, "for the one to be utterly banished." Although there are a number of other explanations (238) of this word (which occurs nowhere else in Scripture), a general consensus in modern times leans towards that given above. Now it will be remembered that the order of man's two dyings is always the same: first a spiritual death, then the physical. And so also must be the Lord's sacrifice: first a spiritual sacrifice, then a physical death. 237. See Notes at the end of this chapter (page 17). 238. See Notes at the end of this chapter (page 18). protracted ceremony, as will be seen, just as the Lord's spiritual death occupied some hours. Consequently, the other goat would have to be kept captive right in the Temple precincts for two or more hours before being put to death. This would have presented certain administrative problems. And it appears likely for this reason that the goat to be slain as a SIN-offering was dispatched before the sending away of the scapegoat. Although the order of these two sacrifices was therefore reversed, it was almost certainly done as an accommodation to the fact that the two animals could hardly be handled in any other way. The whole ceremony was orderly and reverent and dignified. It was an expedient undoubtedly conducted in this reverse order by God's permission in view of these circumstances. Thus the first sacrifice to be carried out, a sacrifice occupying perhaps half an hour at the most, preceded the ceremony of sending the scapegoat into the wilderness, a ritual that might well occupy a couple of hours as the circumstances clearly show. This goat had to make a journey which may well have involved a distance of perhaps five miles or more which could scarcely have been made in less than two hours. And he [the High Priest] shall take a censer full of burning coals of fire from off the altar before the Lord and his hands full of sweet incense, beaten small, and bring it within the veil: and he shall put the incense upon the fire before the Lord, that the cloud of the incense may cover the mercy seat that is upon the testimony [i.e., the two tables of stone within the Ark] , that he die not. The dramatic effect of this preliminary ritual must have been heightened greatly by the fact that throughout the whole year the Holy of Holies had not been entered by anyone. It had remained in darkness, the "thick darkness" in which God dwells. As the priests officiated daily in the Holy Place, which was immediately outside it, they must often have looked at the curtain and wondered what was behind it. They knew, of course, that the Ark of the Covenant was there, but in what form was the majesty of God in that place? There seemed so little of substance between them and the very presence of God, a mere hanging curtain, double though it was and undoubtedly of very heavy material. After all, it was thirty feet high and spanned the thirty feet from wall to wall. Still, it was only a curtain. The High Priest carried with him some kind of container of live glowing coals and probably another container to hold the powdered incense. The glowing coals might give him sufficient light to allow him to approach the Ark of the Covenant; and on the lid of the Ark he placed this container. He then took the powdered incense and cast it on the coals. The immediate effect must have been startling indeed. Billowing clouds of smoke would rise at once and fill the empty cavernous space illuminated by the live coals that would indeed seem a most apt herald of the presence of God Himself who had said (Exodus 19:9) that He would come "in a thick cloud." The glow thus created would probably light up the whole area, large as it was, while yet concealing its boundaries � an effect that must have been tremendously enhanced by the gold sheeting covering floor and walls and ceiling. The splendor must have bounced back and forth with a kind of gilded iridescence, creating an atmosphere guaranteed to impress upon the High Priest the sense of mystery in the sudden coming of Jehovah in his glory. Then shall he kill the goat of the sin offering that is for the people and bring his blood within the veil . . . and sprinkle it upon the mercy seat and before the mercy seat: and he shall make an atonement . . . and there shall be no man in the tabernacle of the congregation when he goeth in to make atonement in the Holy of Holies. * Conder, C. R., Handbook to the Bible, London, Longmans, Green, 1880, p.123. Priest survived the ceremony of presenting the blood and returned to the people. And Aaron shall lay both his hands upon the head of the live goat, and confess over him all the iniquities of the children of Israel and all their transgressions in all their sins, putting them upon the head of the goat, and shall send him away by the hand of a fit man into the wilderness. And Aaron shall come into the tabernacle of the congregation and shall put off the linen garments which he put on when he went into the Holy Place, and shall leave them there. . . . And this shall be a perpetual statute unto you, to make an atonement for the children of Israel for all their sins once a year. Now clearly this goat is standing for a different kind of sacrifice. It does not suffer physical death but the death of absolute isolation. It is driven away as a creature fatally contaminated with man's SINS, utterly banished from all human association. It was sent into the wilderness only after the High Priest had publicly laid both his hands upon its head and thus transferred to it all the SINS of the people as a nation. The use of both hands is significant. The penitent who offered a personal sacrifice laid upon the animal's head only one hand as a gesture of identity (cf. Leviticus 1:2-4). Here the High Priest lays both hands upon its head as a symbol of actual transfer. An innocent creature becomes a guilty one. mile. And so the goat passed from man to man until the last person took it out into the wilderness and there released it. But on the way out, the people in the city and the surrounding countryside, considering the scapegoat as an object of desecration and horror, heaped upon it every conceivable form of verbal abuse and sought to hurry it on its way. They genuinely believed that it was truly burdened with their sins and was now an object of shame and repulsion. The goat had been identified by having a piece of scarlet cloth fastened to one horn. There is no doubt that if it had attempted to come back again, it would have been driven away in horror. But it seems more likely that God Himself would have seen to it that the goat remained separated for ever from the people whose sins it bore. This assumes that the sacrifice was acceptable. What if it had not been acceptable on some particular occasion? According to tradition, this did happen once, and the goat returned from the wilderness. Because of the horror with which the poor creature was viewed by the people, one can imagine their consternation. That it should have returned did not, it seems, suggest to them that the sacrifice was not acceptable to God � only that the arrangement was not acceptable to the community! The authorities determined that it should not happen again. They therefore gave instructions thereafter that the last man should lead the scapegoat to the edge of a precipice and push it over backwards, with the reasonable certainty of breaking its legs, if not actually killing it. This extraordinary precaution was necessary because, pushed over forwards, goats have been known to deliberately land not on their feet but on their head, in order to avoid breaking their legs, and they can apparently sustain a drop of fifty feet without injury in this position. But the whole evolution of the ceremony involving such artificial precautions only demonstrates how far from a spiritual understanding of the truth the religious authorities had finally departed. In the Temple, the people awaited news that the second ritual was completed. When the last man let the goat go, he tore off a piece of the scarlet cloth and with it waved the signal back to his predecessor, who passed the news back to his predecessor in turn, and thus back to the Temple in a very short time. The sins of Israel were removed eastward. The distance was not great, only a few miles. But when the Lord came to remove our sins in his own Person, He removed them to infinity. As Psalm 103:12 states it, "As far as the east is from the west, so far hath He removed our transgressions from us." Thus as soon as word was received from the Temple that the scapegoat was finally gone into the wilderness, there was general rejoicing throughout the land. Their SINS had been utterly carried away, borne into the wilderness by an innocent victim. So was offered in a compound ceremony a sacrifice for SIN and a sacrifice for SINS, a victim executed as a SIN-offering and a victim banished utterly as a bearer of the SINS of God's people. In one Person these two sacrifices were made on the cross, when as a scapegoat the Lord Jesus took upon Himself the guilt of our SINS and was utterly banished from the Father's presence during the hours of darkness; and then as our SIN-offering (2 Corinthians 5:21 *) took upon Himself the penalty of the deadly infection which has made us all mortals, and dismissed his life at the last. We now turn in the next two chapters to examine these two separate deaths in the order of their occurrence at Calvary: first the spiritual, and then the physical. * The use of the word SIN, in the phrase "made to be sin," is widely acknowledged to be an insufficient translation. The Greek word is almost certainly to be rendered sin-offering, as it is frequently in the Septuagint. 236. (See page 2) F. R. Tennant observed that it was universally taught by the rabbis that our first parents brought death upon themselves by disobedience. That Adam did not die on the day he ate the forbidden fruit is sometimes explained by the rabbis, as it is in the Book of Jubilees, by taking the day to be a thousand years [Sources of the Doctrines of the Fall and Original Sin, New York, Schocken Books, 1968 reprint, p.161]. One deviation from this general view, which is found in the Syriac Baruch-Apocalypse, is that the penalty was not in death itself but in its prematureness. Adam's death was untimely. The Book of Enoch, Pseudo Philo, The Apocalypse of Moses, most copies of Baruch-Apocalypse, and 4 Ezra all assert physical death was caused by the Fall. The Slavonic Book of Enoch attributes the introduction of death to Eve, as does Ecclesiasticus (25:24) which reads: "From a woman sin had its beginning, and because of her we all die." The statement is true in a sense, but a far more precise statement is that made by Paul in Romans 5:12. Another view found among the Church Fathers and in Jewish literature (Pirke di R. Elieser, c.13) is that Satan was envious of Adam and desired to murder him, by persuading him to poison himself to death. Again, there is a measure of truth here and it is reflected in John 8:44 where the word murderer in the Greek is "man-killer." Many of the Church Fathers explored the relationship between death and Adam's disobedience. Justin Martyr (c.100�65 AD. ), one of the earliest, wrote: "When God formed man at the beginning, He suspended the things of nature on his [man's] will, and made an experiment by means of one commandment. For He ordained that, if he kept this commandment, he should partake of immortal existence; but if he transgressed it, the contrary should be his lot. Man having thus been made, and immediately looking towards transgression, naturally became subject to corruption. Corruption then becoming inherent in nature, it was necessary that He who wished to save should be the One to destroy the efficient cause of corruption." [This is found as a Fragment of the Lost Writings of Justin, in Ante Nicene Fathers, New York, Scribner, 1913, vol.1, p.301]. It is not merely a concise observation: it also shows how it came about that the word natural was later applied to man's dying even by those who recognize that it was not part of his original constitution. Augustine sometimes speaks of death as natural for man, in this sense. Tertullian (c.160�215) said: "We know what was man's origin and boldly assert and persistently maintain that death happens not by way of natural consequence to man, but owing to a fault and defect which is not itself natural; although it is easy enough, no doubt, to apply the term natural to faults and circumstances which seem to have been inseparable to us from our very birth. If man had been directly appointed to die as the condition of his creation, then of course death must be imputed to nature. Now, that he was not thus appointed to die, is proved by the very law which made his condition depend on a warning and made death result from man's arbitrary choice. Indeed if he had not sinned he certainly would not have died. That cannot be nature which happens by the exercise of will after an alternative has been proposed to it, and not by necessity as the result of an inflexible and unalterable condition. Consequently, although death has various forms, in as much as its causes are manifold, we cannot say that the easiest death is so gentle as not to happen by violence to our nature. The very law which produces death, simple though it is, is yet violence. How can it be otherwise, when so close a companionship of soul and body, so inseparable a growth together from their very conception of two sister substances, is surrendered and divided?" ["A Treatise on the Soul," Ante-Nicene Fathers, ibid., vol.III, p.229]. Ambrose (c.339�397), whose influence on Augustine was tremendous, took the view that death really was imposed as a merciful provision rather than a penalty. He wrote: "The Lord did not inflict death as a penalty but as a remedy. And to Adam when he sinned, one thing was appointed as a penalty, another for a remedy, when it is said: 'Because thou hast hearkened unto the voice of thy wife and hast eaten of the tree of which I commanded thee that of it alone thou should not eat, cursed is the ground in thy labour; in sorrow shalt thou eat of its fruit all thy days of thy life, etc. . . . till thou return to the earth from which thou wast taken.'" So here are the two effects according to Ambrose: the burden of life (the penalty), and death (the remedy). Ambrose comments further: "So, then, death is not only an evil, but is even a good thing. So that it is sought as a good, as it is written, 'Men shall seek death and shall not find it.' (Rev. 9:6). They will seek it who shall say to the mountains, 'Fall on us,' and to the hills, 'Cover us.' (Luke 22:30). That soul, too, shall seek it which has sinned. The rich man lying in hell shall seek it, who wishes that his tongue be cooled with the finger of Lazarus (Luke 16:24). We see then, that this death is a gain and life a penalty, so that Paul says, 'To me to live is Christ and to die is gain' (Phil. 1:21)" ["On the Belief in the Resurrection," Bk. II.37.3]. Francois Turrettin (1632�1687) in his Atonement of Christ [p.81] considered that death was an essential remedy. "There are many other weighty reasons," he wrote, "rendering it necessary that all should die; such as that the remains of sin (i.e., the remaining root left in each of us) may be destroyed." Physical death was, in his view, the only way of destroying the seat of the root of sin, and is the answer to Paul's plea in Romans 7:24. Augustus H. Strong (1836�1921) in his Systematic Theology wrote: "The objection that death existed in the animal creation before the Fall may be answered by saying that, but for the fact of man's sin, it would not have existed. We may believe that God arranged even the geological history to correspond with the foreseen fact of human apostasy (cf. Rom. 8:20-23, where the creation is said to have been made subject to vanity by reason of man's sin)" [Phila.delphia, Judson Press, reprint 1974, p.658]. Death in the animal world before man was therefore a kind of previsionary paradigm of something which was later to be a penalty for man. Of death for the Christian, A. T. Schofield said, "Death is not an entrance into eternity but an exit from time" ["On Time and Eternity," Transactions of the Victoria Institute, London, vol.LIX, 1927, p.284]. 237. (See page 10) According to the Gemarah, which is a kind of Jewish history book of this period, the scarlet cloth which marked the scapegoat was supposed to turn white as a sign of God's approval in accordance with Isaiah 1:18. But we are told that this never actually happened during the last forty years before the fall of Jerusalem in 70 A.D. Whether the Jewish people were aware of the significance of this tradition, or indeed whether the change of colour had actually occurred in previous years, or was just a Jewish invention, are questions which cannot be answered now. But it is interesting that the tradition survived in their literature, and yet their religious authorities do not seem to have realized its meaning. The tradition is referred to by Alfred Edersheim, The Temple: Its Ministry and Services, Grand Rapids, Eerdmans, 1972 reprint, p.312. 238. (See page 10) For treatment of the word Azazel, see Smith's Dictionary of the Bible, Grand Rapids, Baker reprint, vol.I, p.197. Also Hastings Dictionary of the Bible, New York, Scribners, 1905, vol.1, p.207, and Lange's Commentary, Grand Rapids, Zondervan, 1976 reprint, vol.1, at Leviticus 16:8, p.127. Also L. Feinberg, "The Scapegoat of Leviticus 16," Bibliotheca Sacra, vol.115, Oct.,1958, p.320-333; The Standard Jewish Encyclopedia, subject Azazel, p.206; Louis Ginsberg, Legends of the Jews, Philadelphia, Jewish Publication Association of America, 1955, vol.1, p.148 (= a fallen angel); G. F. Ochler, Theology of the Old Testament, New ork, Funk & Wagnalls, 1883, p.311; and F. R. Tennant, The Sources of the Doctrines of the Fall and Original Sin, New York, Schocken Books, 1968 reprint, p.182 (connected with "Fallen Angels").